Today we’re starting the artist interviews with artists from our Dia de los Muertos: Celebration of Life Exhibition (presented in conjunction with our Dia de los Muertos Festival on November 5). We have over 20 artists in the show, so expect to see a lot more of these posts coming up. Our interviewee for the day is Melo Dominguez, a Los Angeles native who now lives and works in Tucson, Arizona. During her time in Tucson, Melo has captured the hearts of many with her artwork. Her artistic style highlights social and political themes, street culture, and is as multi-layered and multi-faceted as she is. She is a member of Raices Taller 222 Art Gallery & Workshop in Tucson, AZ. 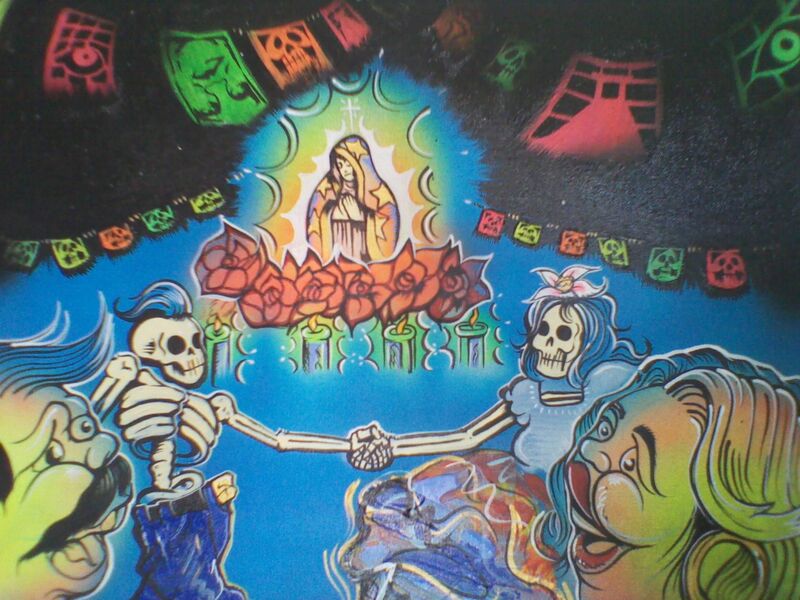 Did you grow up with El Dia de los Muertos? I didn’t grow up really celebrating traditional day of the dead, but I was surrounded by the death family & friends from a very young age. I attended all my great uncle’s funerals and visited their graves every Sunday with my grandfather. What’s your favorite Dia de los Muertos symbol? The sugar skull is one of my favorite Dia De Los Muertos symbols. What mediums do you work in? Which ones would you like to try? How are they similar and different? I like working with various mediums, acrylic, spray paint, water color. I like to manipulate them. matte with high gloss. How does culture influence your art? Culture is everything for me. I love people, music & social issues. What are you working on right now? What are you doing next as an artist? I’m currently getting ready for ArtLAb www.rillitoriverproject.org really excited to be part of this project. great time to be an artist. ← El Dia de los Muertos- The Exhibition is Up!!! Melo it’s been exciting to watch you and your art blossom right before our eyes. May the good Lord keep using you to bring to life social issues and bring about change in our feeble minds. Proud of you and put the petal to the metal mija. Xico’s Summer Monotype Print Art Sale has been Extended!! Sashimi Anyone…how about this for creativity! Fun Summer Crafts to keep Art Alive in your Home !